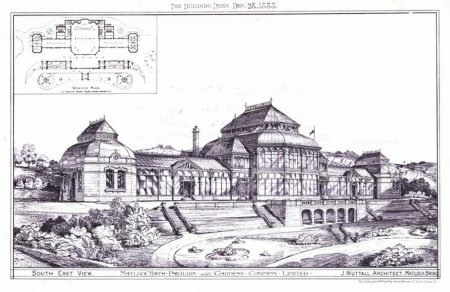 Old Pavillion before 1902, unposted but "undivided-back",. Enlargement from postcard above (conifer=3.5 ft). J.Nutall, Architect. A few changes are apparent. 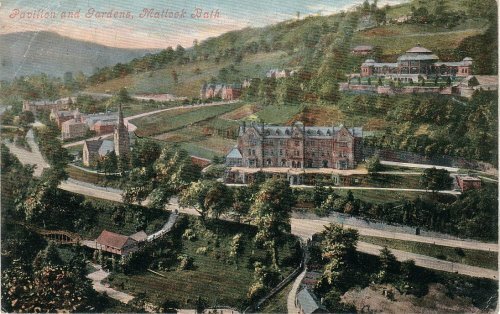 From a hand-tinted postcard posted on 13 July 1905. The original b/w photo may be from the 1890s, a careful study of the buildings may tell. In the bottom-left is a wooden building with "SWITCHBACK" in large letters. The start of the ride goes into the trees, but the rest of this amazing construction can be seen on X345. There is a smaller building at the far end, where customers are put onto the return track. An attempt has been made to measure the height of the conifer next to the steps, on the basis of 9 inches per step. 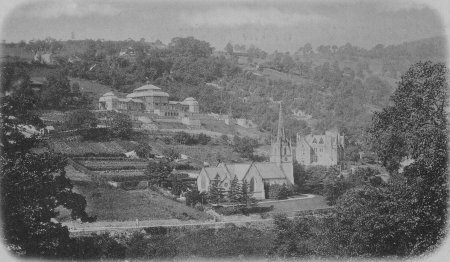 Behind the Royal Hotel, up the hillside, is the old Pavillion or Palais Royal, opened in 1884. Its stage drew famous actors and band contests. The Pavillion was altered in 1910. The very faint photo shows its original, rather magnificent shape, with very large window area. The photo was produced by Percy Rowbottam in the Royal series Sunshine Pictures. 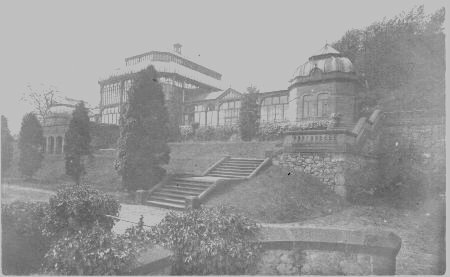 Old Pavillion before 1910, (conifer=28 ft).